(Nanowerk News) Helium usually reminds people of colorful gas balloons. However, helium is much more than the filling for these children’s treats. It also helps quantum physicists to study the most exotic and hidden properties of matter. An international team led by Denis Konstantinov, Professor at the Okinawa Institute of Science and Technology Graduate University (OIST), discovered a condition by which electrons trapped on the surface of liquid helium become incompressible at very low temperatures and under microwave radiation. These findings were published in Nature Communications ("An incompressible state of a photo-excited electron gas") in collaboration with researchers from the Universite’ Paris-Sud and the RIKEN Institute. Compressibility measures a change of volume when a pressure is applied. Normally compressibility is always positive. But more pressure results in less volume. Imagine a rubber ball: the more you press it, the more it squeezes. This happens because the distance between the atoms of the rubber ball decreases when you apply pressure. The same is true even for solid objects, like a table. Although you cannot perceive it, if you press on a table, you actually force the table to become just a little bit thinner. On the other hand, in a condition of zero compressibility, even if you increase the applied pressure, you cannot change the volume. 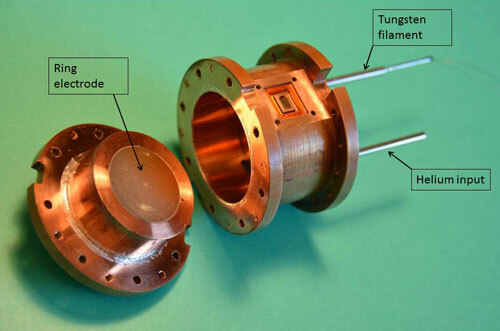 Konstantinov and his collaborators are interested in studying these curious states and found that under specific conditions, electrons’ compressibility becomes zero. The team is studying electrons pulsed out from a tungsten filament and trapped on the surface of liquid helium at extremely low temperatures. Helium was chosen because it is the only known quantum liquid: it becomes liquid at low temperatures and it remains liquid even at zero Kelvin. Moreover, it is free of impurities and it can form a very smooth surface with only tiny ripples of less than 1 Angstrom, which is comparable to the size of a helium atom. In a 3D space, usually particles can move in every direction, but at low temperatures the system of trapped electrons can be simplified to a 2D configuration and the scientists can concentrate on the 2D movement of the electrons on the surface of the helium layer. 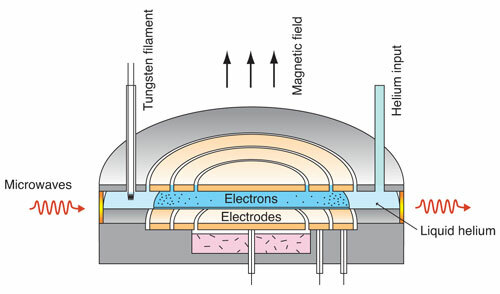 Above and below the helium 2D layer there are two ring-shaped electrodes with an oscillating electric potential. Applying an oscillating potential is equivalent to applying a force, therefore pressure, to the electrons. The team measured the density of the electrons, which is linked to the distance between the electrons under specific magnetic field conditions and microwave frequencies, and found that the distance between the electrons does not change, meaning that their compressibility is zero. The same experimental set up leads also to another intriguing phenomenon that is zero resistivity. Zero resistivity is also very rare in nature and it indicates that if you apply an electric current it can flow indefinitely inside the material. “Every time you observe zero resistivity, it is a very big issue in physics. You always expect to see some dissipation or friction in nature, but if you find something moving with zero resistivity, so without dissipation, without friction, you want to understand what is going on. It is like if you push an object, and it will move and move forever without stopping: it is very unusual!” explains Konstantinov. The scientific community is still looking for an explanation for these unusual phenomena. “We don’t know how the electrons move to achieve a state of zero compressibility and zero resistivity. It is a unique state of nature”, underlines Konstantinov.